Today Microsoft launched the new Bing App for iPad, and it comes with a range of new features, which lets you view news articles, search for photos, check out movie listings and lots more. It’s a free download and you can download it from App Store and comes with all the features of the iPhone version. 1. Swipe through our touch enabled movie listings, news articles, trending topics, local businesses and other rich, immersive search results. 2. Stay current with the latest news, traffic, weather, stock quotes, movies and popular searches from the main screen. 3. Bing Local and Map integration to help you find the places you are looking for from directions with real-time tracking to immersive road, traffic, aerial and “bird’s eye” views. 4. Follow the latest news and trending topics with beautifully iPad optimized results with rich images and magazine inspired layouts. 5. Tell Bing what you are searching for with voice activated search. 6. Wonderful touch friendly, grid view of image searches, with source site details and full page preview. 7. 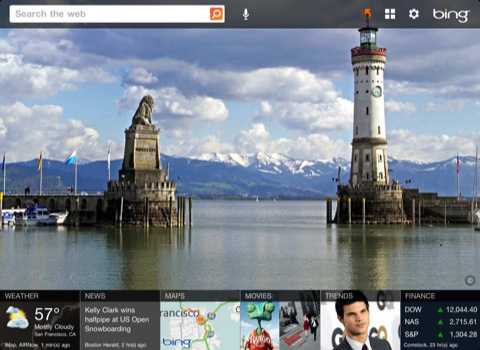 Easily navigate between Bing results and websites as Bing frames the site to make it easy to return the search or to launch a new one.